By Richard WalkerNorth Kitsap School Board member Scott Henden said he can't accept the Suquamish Tribe’s sovereignty. And his views contributed to the postponement Nov. 8 of an interagency agreement regarding the Suquamish Tribe’s Chief Kitsap Academy, a school that offers the district’s Native students culturally based classes for which they can earn college credit. The agreement is between the Tribe, which operates the school; the school district, which shares students and resources with the academy; and Olympic College, which awards credit for classes taken. Henden expressed concern about language in the agreement referring to Suquamish as a “sovereign nation.” He also expressed concern about a reference to Suquamish’s “sovereign immunity,” which relates to a tribal government’s immunity against many lawsuits unless immunity is waived by the Tribe or Congress abrogates it. Henden first asked for a definition of sovereignty. “I know that’s something important to them. I’d like to know what that means in more detail … I’m not sure I understand the words they’re using. When they talk about sovereignty, what do they mean there? I really want to know, and what are we teaching our kids?” After some discussion, he stated, “I need to do some reading of my own. I guess I want to understand the issue better.” But then he went on to detail his views of sovereignty. “I understand they are federally recognized. I understand the, at least in part, the issue of Native abuse over the years. I won’t say I understand it totally by any means, but at least in part I understand some of their issues,” Henden said. “I have a problem understanding [in] any kind of English where those words go together and it means what we have. I don’t see them as a sovereign nation. Norway is a sovereign nation. And I don’t see why we need to agree to that so that we can have a contract with them. “If they are a sovereign nation, they’re self-sufficient, they’re self-funded, they’re self-protected and there are some things that go with it, at least in my mind. If somebody can give me something other than that in the dictionary that shows that putting those two words together means what we have, I’d be glad to see it. Henden claims it's "politics" to include tribal sovereignty but not politics to leave it out? Wrong. It's political either way. Henden equates tribal sovereignty with the "past," which means he doesn't want it in the present. He doesn't want tribes to be on an equal footing with states, he wants them to be inferior. He also equates tribal sovereignty with treaty rights, which isn't exactly true. Tribes would have sovereign status even if they hadn't signed treaties. Indeed, some of them didn't sign treaties. He's obviously upset about how much the federal government spends on tribes. That may be his primary motivation: to cut spending and make poor people suffer. Board president Weedin rightly pointed out that the spending level has nothing to do with whether tribes are sovereign. Treaties are what obligate the spending, not sovereignty. Finally, Weedin is simply right on the facts. Tribal sovereignty is recognized in the Constitution just like freedom of the press and the regulation of commerce. You can argue about how these things are interpreted and implemented, but you can't argue with the fact of their existence. For more on tribal sovereignty, see GOP Activist: "Sovereignty Is Bunk" and Americans Support Tribal Sovereignty. Below: I suspect this is part of why Henden opposes tribal sovereignty: because it means acknowledging that America was built on stolen Indian land. This is amazing. Was there not a single attorney there to explain basic state, federal and tribal entities? Maybe just a civics teacher that can help him on the track along the analogy of states to tribes. I know what someone is getting for xmas this year! To me, this shows an underlying problem with school boards. I think that in many parts of the US, school board candidates run unopposed, or the public never gets a chance to learn much about the candidates. So, it's pretty easy to get on a school board in a lot of communities, and you don't have to be very smart. And you wind up with people like this making decisions that govern the education of our youth. What he's saying doesn't make ANY sense, and it's pretty plain from that article that his fellow board members want him to just STFU so they can go on offering college credit to their Native American students. What it is that "Frilixia Vienna 100 Patisserie Desert" has to do with tribal soveriegnty is beyond me but it does paint the bizarre and clearly absence of intelligence non-natives seem proud to display about native peoples. 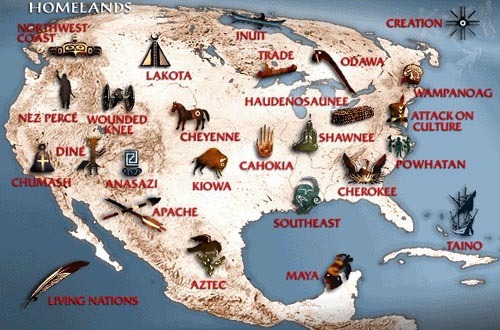 Out of 100 non-natives, I would say 50% do not believe Indians still exist, 25% say we do exist, but we get monthly checks and pay no taxes or we all own our own casino and get free money, 24% think Indians are all welfare recipients (as if native land, timber, oil, coal, etc) never attributed to the wealth of whites and probably 1% know somebody Indian, but still can't connect the dots about anything culturally past John Ford movies and derive their Americana on stereotypes. This blog has been getting a ton of spam lately. That's what the "Frilixia Vienna 100 Patisserie Desert" comment was. The Blogger software usually deletes these comments automatically, but it didn't in this case. Are you distinguishing between treaty-benefit checks (25%) and welfare checks (24%), Anonymous? I doubt most Americans could or would make that distinction. They just think Indians receive checks, period. I'd amend your guesses to say 50% don't believe Indians still exist, 24% think they receive government checks, 24% think they receive casino checks, 1% doesn't think any of the above but has a stereotypical view of Indians, and 1% understands the reality whether they know an Indian or not.